Feel free to use this pressing info, but please note that I, Ferry Krop, compiled and gathered all the info over the years. all with help from many people especially Mike Hartsfield. 1st press 500 clear vinyl, dark blue bar on cover (looks almost completly black & brown thick paper used), tan labels, blue hand on lyric sheet size 12" by 12"
1st press 1000/2000 black vinyl, dark blue bar on cover (looks almost completly black & brown think paper used), tan labels, blue hand on lyric sheet size 12" by 12"
The first press is about 100% sure, maybe the numbers for the black vinyl could use some attention. Comes with leftover covers from the 1st press: dark-blue-bar cover (almost black). The slighlty brighter dark blue stripe cover is the 2nd press cover. White labels, red hand on lyric sheet size 12" by 12"
The second press is quite confusing and we think a mixture of everything: leftover covers from the 1st press (almost complete black covers, no blue to see. I maybe think there were pressed 3000, maybe up to 5000 covers) and a new press of covers which has the ‘brighter dark blue bar’ on it, which is not to be seen on pictures. We think New Age first ran out of vinyl and inserts but had covers left over from the 1st press. But due to the covers still not looking the way they were supposed to be, we are blessed with the 3rd version cover: the nice bright blue bar cover came, mixing everything up. And lyric sheets with the red hand. But also we think, that at the end there were no lyricsheets so they made the one sided xeroxed letter-size lyricsheet, with no hand what so ever (this version is very rare) and therefore we think a quick xerox to complete the press, all before the actual pro-printer 2-sided letter-size insert came. 3rd press 1000/2000 black vinyl, nice bright blue stripe on cover (white cardboard used), tan labels, 2-sided lettersized lyricsheet. The third press is the version with the 2-sided lettersized lyricsheet with hand on it. This one is seen more often, and always comes with the rest of the nice bright blue bar covers. This cover is definitely the last version of covers, since there is no address on this one, the address has been deleted. This version maybe has leftover vinyl from the second press (white labels) and somehow a new batch of vinyl has the tan labels. To sum it all up: we figure there are 3 different cover pressings, 4 different lyric-sheets and 3 maybe 4 different vinyl pressings (starting with tan labels, going to white labels and ending with tan labels again). Looking at all the covers and inserts, the 2nd press vinyl comes with, there might have been another vinyl pressing completely identical to the 2nd pressing.
? test presses, red vinyl, white label. Is it save to say, that since these hardly pup up, there are less than 10 pressed? Some, maybe all have Xeroxed sleeves made up for them saying ‘test pressing’ made by Mike. Dennis/Outspoken believes there were 2 sets of testpressings, one per label, since this was a joint release between New Age and Conversion. These should have labels of each label he says on Instagram but I have only seen white labels on the test. This 1st press was made for a tour they later on had to cancel and were made prior to any with actual printed labels/covers. Dennis/Outspoken on Instagram January 2016: “Originally we weren't going to do a special pressing but there were delays with the covers, inserts, and labels. We had plans to do a tour back east and wanted to have records to sell. So we had the pressing plant press 500 black vinyl records with white labels. We created a simple version of the cover and insert that we could have photo copied easily. Our tour was scheduled to start in Chicago at Tony Brummel's (Victory Records) house back when he did basement shows. I forgot the name of the "club." Club Blitz possibly? I also seem to remember it was Tony who offered to print the limited edition covers for us at his Kinkos job. I wonder how many bands have benefited from friends working at Kinkos? So we had the records pressed and we hand wrote messages on every single label. Also, the covers are numbered but we weren't into that sort of stuff at the time so we made a bunch of fake numbers. There are several #1/500. It was a joke. We were going to have Relapse from Michigan play the shows with us since I had recently made friends with them and they offered to share their equipment. Things fell apart on our end and we never did the tour. But Relapse did anyway and I went along as a roadie. I sold a bunch of the limited edition 7"s while on tour with them. It helped us spread our music back east. There are roughly 200 of the black & white covers, 150 blue and 150 yellow. We wanted only black & white covers but when we got them, there were some blue and yellow too. We used up all the black & white ones first, then split the rest between the blue and yellow.I wrote most stuff down to keep track but couldn't find my notes about that pressing unfortunately.” Hand written labels courtesy of Mikey Garceau (Drift Again). 4th press (2014), half clear vinyl/half clear orange split color vinyl /500? 1st press 50 solid purple marble vinyl, black white labels, purple screaming girl cover, sold at the Middlesex show, revered to as “Middlesex edition” numbered with stamp on the inside of the cover. One unnumbered copy is known, which probably makes this number 51. 1st press 10 Pigface cover. Numbered. Made by Pete (guitarist) for fun: ‘when the first 7” came out, I made ten of those covers. 5 for the band and the other 5 went to close friends. 5 blue ink and 5 black ink’. Limited pressing was made for the Sound and Fury fest by the band. Only 50 were made with a custom cover and insert, custom labels,and a special colorway. These are all be hand numbered. The cover is a collaboration with artist Eyeone (Who ran the Macondo in the '90s), and these were individually printed the same way as a limited edition Giclee art print. These were only available during Sound & Fury 2010, sold out in a couple of minutes!
? test presses, black vinyl, white labels. Is it safe to say, that since these hardly pup up, there are less than 10 pressed? 2nd pressing 275 solid orange creamsicle vinyl, plain orange B-side label with hand stamped "We Must Continue..."
2nd pressing 193 solid coke bottle clear with black streaks vinyl, plain green B-side label with hand stamped "We Must Continue..."
2nd pressing 38 solid dark yellow marble vinyl, plain orange B-side label with hand stamped "We Must Continue...". Fun Fact: The process of mixing to get the correct orange color, gave us a few distinctly yellow ones. 2012 press, black vinyl with insert, Hand numbered out of 50, comes in a plain white jacket with sticker. Original mastering. The Record was only available on the European Tour 2012, sold out at the first shows!
? test presses, black vinyl, white labels. There seems to be a red vinyl, white label test from this record. Mike things the red one came first, after a while a new set of stampers were needed and a new test was made: the black vinyl one. There seem to be different kind of pressings? Maybe 2 or even more? The black vinyl version I have has a glossy finish on the cover. The dark grey marbled version has a mat finish on the cover. Even the paper used on the lyric sheets differ, but you can only tell while having them both in your hands. It’s just a different kind of paper. So there seems to be at least 2 different kind of pressings. "Not a first press... first/second press was only on black vinyl. This is a much later around 96/97...no idea how many were made, maybe 500?" 2011 press 77 pressing, green vinyl. Comes in Xeroxed sleeve, no lyric sheet and the typical 77 pressing labels: the Walkpride b-side label on both sides. 1st press 255 black/white vinyl. Fun Fact: This is also "back on top of white" since the process takes 2 piece of each color placed on top of each other by hand to get this effect. 2nd press (2011) 77 pressing, grey marbled vinyl. Comes with the typical 77 pressing labels: the Walkproud b-side label on both sides. NA37 Insurgence – let’s rock CD only! 2nd press 55 glow-in-the-dark vinyl, Fun Fact: The labels on this record are blank 7" labels with "A18" hand written by Isaac. 2nd press 48 opaque green vinyl, silver cover, 10 year anniversary edition. All 48 jackets are # stamped on the back. NA41 V/A – setting the pace CD only! NA42 the Pop narcotic – ride CD only! NA44 Aftermath of a Trainwreck – horseshoes… CD only! NA45 Countdown to life – govern yourself accordingly CD only! NA46 Hellfire trigger – sent down to burn CD only! NA47 Just went black – tides CD only! NA48 V/A – louder than words CD only! NA49 Fight Everyone – up against the world CD only! NA50 5 Victims 4 graves – desperation never CD only! NA51 This time tomorrow – nadir CD only! NA52 Just went black – embracing emptiness CD only! NA53 Today and everything after – hell is here CD only! 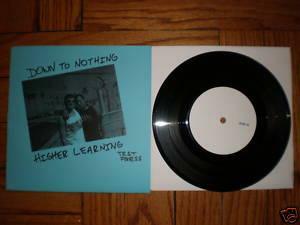 There were only 5 test presses made and two of them were destroyed and thrown in the trash after their guitar player left them in his car to melt. The tour edition vinyl: there were only 200 pressed and they are all hand numbered (this is not the mail order version New Age sent out). They were made because when LOTB went on their first tour the records artwork had not been completed, but they wanted to sell the record so new age made 200 of them for LOTB take with them. They sold out within the first two weeks on the road. NA55 One Choice – last one down CD only! NA57 Fight Everyone – invictus fidelitas CD only! NA58 Time for change – memoirs CD only! 1st press 150 purple marble vinyl with limited “Viva Hate Edge” cover. Released on their farewell show in San Diego, October 24, 2009. Last 50 copies were sold via New Age Web store. Each copy is hand numbered with silver pen. 1st press 1 (!) half Maroon/half Yellow opaque vinyl, Fun Fact: Given to New Age as a gift from Erika Records. Currently in a private collection in Europe. Mike stated in early 2012 to stop his label and focus on his wrestling company. In January 2016 Mike brings the news: New Age Records returns! ‘Next up will be the Drug Control ‘stabbed’ 7”’. But the Freewill LP will eventually be released earlier. 45 test presses, black vinyl, white labels, comes with a one-sided letter-sized inlay saying it’s the test press and a preview of the payout of the cover and labels on it. 1st press (june 2016) 77 pressing, green marbled vinyl. Comes with the typical 77 pressing labels: the Walkproud b-side label on both sides. 20 test presses, black vinyl with white blanco labels. Comes with limited sleeve numbered /20. 1st press (August 2016) 500 pieces made with a total of 12 different colors in total. Pressed in Europe by the band, but still an official release for New Age records even though you can’t tell by the etching on the record. 1st press (December 2017) 77 transparent blue vinyl ’77-pressing’. Comes with the typical 77 pressing labels: the Walkproud b-side label on both sides. 1st press (sept 2017) 77 clear vinyl ’77-pressing’. Comes with the typical 77 pressing labels: the Walkproud b-side label on both sides. 1st press (Sept 2017) 77 gray-marbled vinyl ’77-pressing’. Comes with the typical 77 pressing labels: the Walkproud b-side label on both sides. 1st press (sept 2017) 77 trans yellow w/ black streaks vinyl ’77-pressing’. Comes with the typical 77 pressing labels: the Walkproud b-side label on both sides. 1st press (November 2017) 77 solid orange vinyl ’77-pressing’. Comes with the typical 77 pressing labels: the Walkproud b-side label on both sides. 1st press (may 2018) 77 marble baby blue vinyl ’77-pressing’. Comes with the typical 77 pressing label (the green Walkproud b-side label) on only the B-side of the vinyl. This 77-pressing comes with a special Xeroxed sleeve and is hand numbered with a red marker ‘/77’. All other versions have a white Walkproud b-side label on the B-side. 1st press (july 2018) 77 black vinyl ’77-pressing’. Comes with the typical 77 pressing labels: the Walkproud b-side label on both sides. About 20/30 test presses, black vinyl, white labels with Count Catastrophic stamp on it. 1st press (feb 2019) 77 green with red streaks vinyl ’77-pressing’. Comes with the typical 77 pressing labels: the Walkproud b-side label on both sides. 1st press (October 2018) 77 white vinyl ’77-pressing’. Comes with the typical 77 pressing labels: the Walkproud b-side label on both sides. 1st press (March 2019) 77 purple marbled vinyl ’77-pressing’. Comes with the typical 77 pressing labels: the Walkproud b-side label on both sides.